Applauding the scenery is an accepted theatre tradition. Like the standing ovation, it is now automatic, and institutionalized. Occasionally, downtown venues like HERE and LaMama permit post-curtain looks without touching. The closest one can get at the Metropolitan Opera House are at designated display areas. 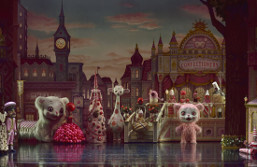 American Ballet Theatre goers enchanted by Alexi Ratmansky “Whipped Cream” — the highlight and hit of their 2017 Spring/Summer season — found designer Mark Ryden\’s cuddly creations for the deliberately off-center ballet on tee shirts, stickers, expensive prints that sold as quickly as the tickets, and his website. The Ratmansky-Ryder collaboration merits it. “Whipped Cream” is ABT\’s viable alternative, and addition, to the story ballets they perform so well. As with “Golden Cockerel” and “Sleeping Beauty” (Ratmansky’s one-act “Aurora’s Wedding” performed during the past season now includes restored choreography by Bronislava Nijinska and Dame Ninette de Valois), “Whipped Cream” is a reconstruction. Thus the only things surviving from the 1924 “Schlagobers” (Austrian for “Whipped Cream”) is its plot about a Boy (Daniil Simkin) with a sweet tooth and Richard Strauss’s score. Better known as serious and occasionally experimental opera composer, Strauss\’s music is lighter than his “Der Rosenkavalier” with its waltz tunes but just as sophisticated. Ironically, the only reference to the Old World was a group of menacing nurses in starched World War I uniforms who menace the Boy with comically oversized hypodermic needles. That is a serious slice of performing arts history — and “Whipped Cream” is anything but. Ratmansky’s choreography adjusts to plot developments lightly but persuasively. Act I is set in the Viennese candy shop where the Boy gives himself an ice-cream headache/stomachache. The fun starts after his departure and closing time when the merchandise climbs out of their boxes and tins and dance the night away led by Princess Tea Flower (Stella Abrera) and Prince Coffee (Marcelo Gomes). Act II revisits the delirious Boy, who is rewarded in his quest for the perfect whipped cream by gaining entry to a pop- art Candyland populated with fuzzy animals (puppets, dancers and supernumeraries), candy store citizens, and Princess Praline (Sarah Lane). Whipped Cream is personified by a corps of women in appropriately swirly attire and in a mixing bowl carried with pride by a pastry chef wearing an oversized headpiece. And in keeping the “Lincoln” in Lincoln Center, President Lincoln\’s portrait was part of the scenery. Ryden\’s designs call to mind Margaret Keane’s “Big Eyes” painting only his aren\’t disturbing. What could have been a misfired parody or the worst of what ballet represents is creative, and inspired. The colorful stage picture mesmerized younger audience members. It was nice seeing Simkin and Lane not suffer as they did as Onegin’s other tragic couple. Since “Whipped Cream”, Simkin announced joining Staatsballett Berlin (while staying on at ABT) and Lane promoted to Principal Dancer. They complement each other well. The last artist closely identified with a dance company was Edward Gorey, a regular New York City Ballet attendee whose “Five Basic Ballet Positions” still appears on their merchandise. Perhaps Mark Ryden will become ABT\’s image maker. “Whipped Cream” was part of American Ballet Theatre’s season at the Metropolitan Opera House, which took place May 15-July 8, 2017. For ABT\’s tour schedule, please click here. Mark Ryden’s “Whipped Cream” designs are located on his website.